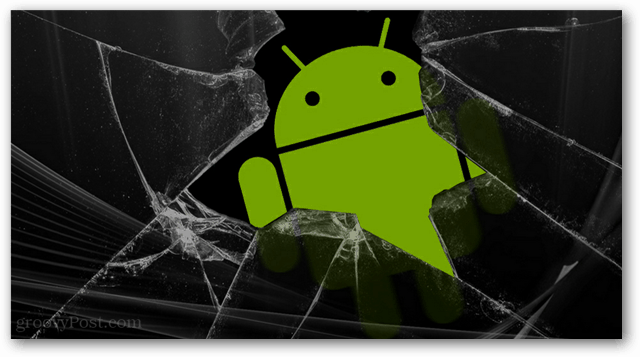 Before you begin tweaking your shiny new Android gadget, you should create a system backup first. 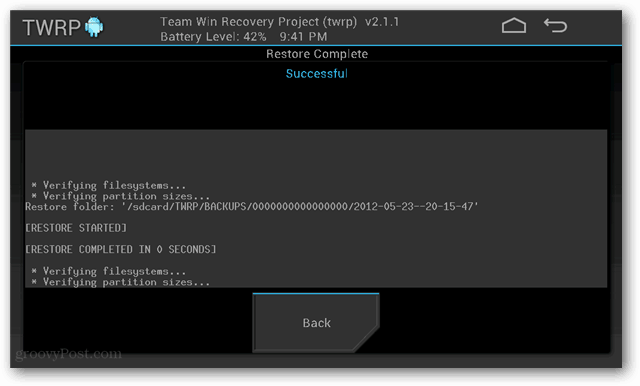 TeamWin Recovery Project (TWRP) is a touch-screen based recovery tool built for Android smartphones and tablets. Here’s a look at this dead simple utility that every Android user should have in their toolbox. Before you begin tweaking your shiny new Android gadget, you should create a system backup first. 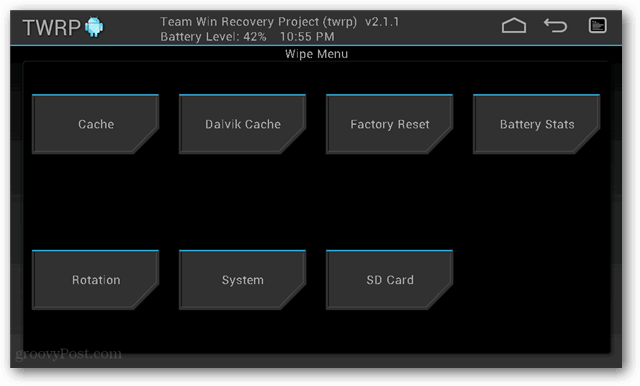 TeamWin Recovery Project (TWRP) is a touch-screen based recovery tool built for Android smartphones and tablets. If something goes wrong and your device bricks or crashes, you’ll be happy to have a recovery tool that brings it back to life. In case you’re wondering, a recovery tool is a small isolated app that doesn’t require the Android operating system to run. Back in the Windows 98 days it could be compared to booting into DOS. From the recovery system you can create backups, flash custom OS installations (ROMS), a factory reset or wipe the entire system. It also has a few other features that help with device maintenance. Finding a download link and the easiest way to install TWRP can be a bit trick. The official site has a drop-down menu with installation instructions, but often times there’s an automated script floating around some development forums that automate the install. TWRP was the first thing I installed on my Kindle Fire before rooting it and flashing to a custom rom. This was for two reasons. First, to create a backup of the current system in case something went wrong. And the second, TWRP makes it easy to flash custom roms. 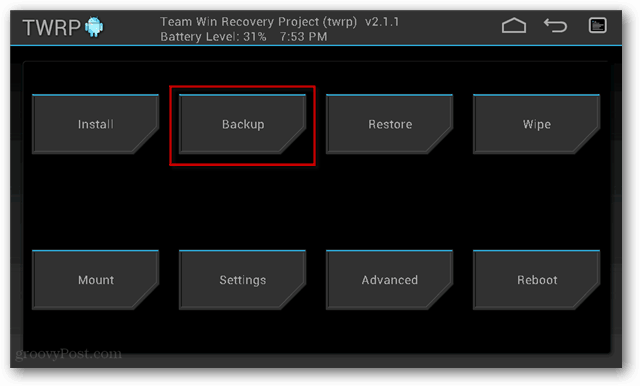 To create a backup with TWRP tap the Backup button. There’s several options within the Backup menu, but if you’re unsure which types of files are necessary just keep everything checked. Then Swipe the blue arrow to start the backup. Once complete, TWRP’s backup will be safely stored on the SD card. 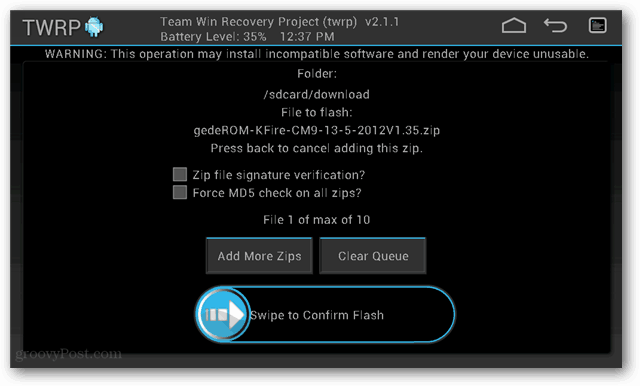 Bringing the system back with a restoration of a backup file is also easy with TWRP. Open the Restore menu and select which backup to implement. It shouldn’t take long, and once it’s done, your Android system will be back to the way it was when the backup was made on your device. TWRP is proficient at performing factory resets as well as six other types of data wipes. Each wipe is performed with one tap and one swipe to confirm. The only way to undo a wipe is to restore a backup. Note: The SD card cannot be backed up using TWRP. TWRP is a mean contender along my other favorite flashing tool, Clockwork Mod. No, this isn’t the kind of flashing you go to mardi gras for! Custom roms are community and independent developer built editions of the Android operating system. Because most Android device manufacturers lag behind on updates and development, users and homebrewers have picked up the slack. Flashing is just another term that essentially means installing them, and TWRP handles this nicely. 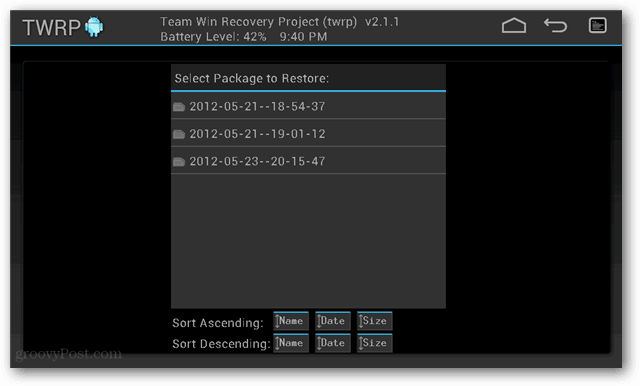 Overall TWRP is a fantastic recovery tool. I recommend that anyone using an Android device install it. Keep in mind that installing this can void the warranty of your device; this depends highly upon the manufacturer’s warranty terms. TWRP doesn’t require you root your device, so in most cases your warranty is safe. 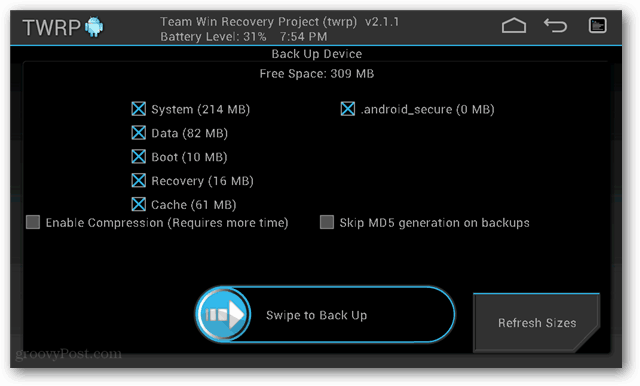 If you don’t like the idea of rooting or flashing a device, TWRP does a fantastic job performing backups. No support for ZENITHINK Tablets ? Guten Tag, dieser Beitrag über das Themengebiet Systembackups ist wirklich sehr interessant. War mir eine Freude diesen Post zu lesen. Danke und liebe Grüße, Paula.